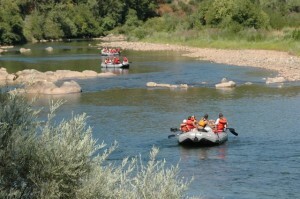 AO Blog > California Rivers: Flows, News, Events > South Fork American > South Fork American River Clean Up Today! Thank You! South Fork American River Clean Up Today! Thank You! Ever wonder what happened to that tube of sunscreen that rocketed out of your zinc-coated hands and flew into the bushes just above Satan’s Cesspool, or where your camera that you swore you had securely tied to the boat ended up at the end of the day as you took out Folsom Lake after a day rafting the South Fork of the American River? I have no idea. But I’ll tell you who does: all the volunteers from the rafting community–commercial rafters and private boaters alike!–who are out on the South Fork of the American River today helping with the river clean-up effort. This is an annual event that helps keep the South Fork the beautiful river it is despite it being one of the most heavily rafted rivers in America. So thank you volunteers!!!! You rock!!! If you’re interested in helping at one of the next clean-ups (there is one August 16th and 29th), check out the American River Conservancy, which partners with El Dorado County to organize these events, for more information. Above: If it weren’t for the efforts of volunteers during events like the South Fork Clean-Up the banks of the river wouldn’t look like this–they’d probably resemble one of the giant garbage patches in the ocean………Not a pretty picture, that.